2. Add your chickpeas and squash into a roasting tray. Drizzle with a little olive oil, tamari cumin and salt. Roast in the oven for around 45 minutes, tossing at 15 minute intervals to make sure they are evenly cooked. 3. Meanwhile put 1/2 cup of quinoa into a pan with 1 1/2 cups of water. Bring to a boil, and boil for around 20 minutes, adding more water if needed. Leave on the side to cool. 4. Now de-stem the kale and place it all in a large bowl. 5. For the dressing you can either blend it all up in a blender or do it by hand. 6. 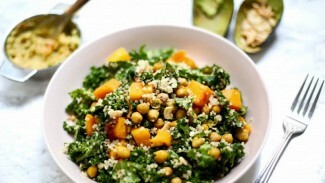 Scoop the dressing into the bowl with the kale and it’s time to get your hands dirty! Massage the dressing into the kale for around 3-5 minutes until the kale leaves are soft and look almost wilted. 7. When all your other components are done, mix them in. Topping it off with some toasted cashews, if you choose.